By grace of God, I married into a family of Irish descent. I have many brilliant Irish cousins now, and have been blessed enough to have visited the Emerald Isle three times. Ireland has such a beautiful countryside, with green pastures, stone field fences, farm houses, sheep, and plentiful castle ruins to explore. One thing that I can attest to, is that the Irish love good food, a pint of Guiness, and telling a good yarn over it. They are such lovely people. 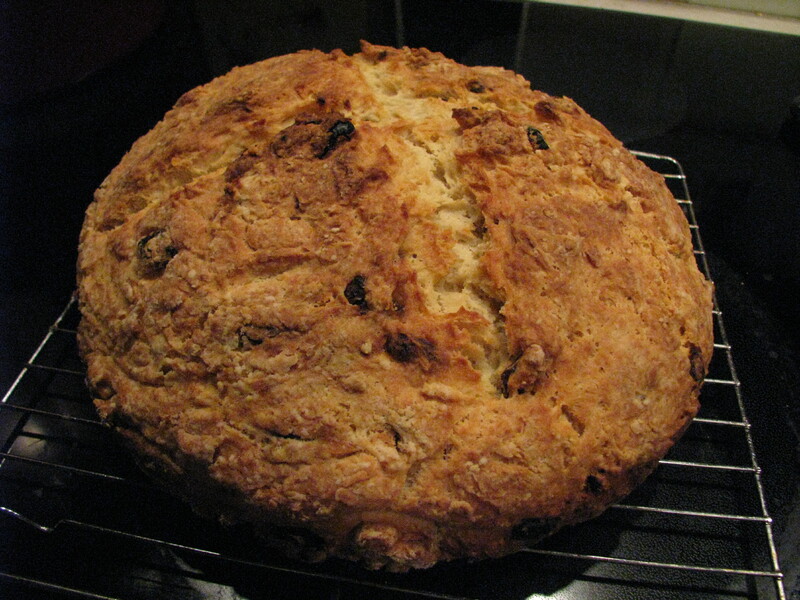 For St. Paddy’s Day, I’ve made soda bread. I have seen my mother make it as a child, but I had never tried it. It is actually quite easy, as soda bread does not require fermenting yeast to make it rise. Interestingly enough, rising with soda is due to a chemical reaction with the lactic acid in buttermilk to create carbon dioxide gas, and also steam from cooking. Due to the climate and soil, wheat grown in Ireland is a low-protein (soft) variety that is lower in gluten, which is why the use of soda is necessary as opposed to yeast as a leavening agent. Gluten is key to producing the stucture in yeast breads, as it’s elasticity in the dough is what allows carbon dioxide to be trapped in the loaf while rising; without it, you get a very hard flat loaf unless you use something else like soda. I have made this recipe with all-purpose flour, but cake or pasta flour is lower in protein and likely will make an even softer loaf more in keeping with the original flour. 2. Grease the inside of a dutch oven with butter and flour it lightly. 3. In a large mixing bowl, mix flour, sugar, baking soda, baking powder, and salt. 4. With a pastry cutter, cut softened butter into the flour mix. I use Kerry Gold Irish butter, but that is a personal preference. 5. Add raisins to flour mix. I favor sultanas (golden raisins). 6. In another bowl, beat egg lightly into the buttermilk. 7. Add buttermilk mixture into the flour by hand a little at a time. Try to avoid over mixing; if you overmix, too much of the carbon dioxide escapes causing the bread to get hard. 8. Turn out the dough onto a lightly floured surface and knead briefly to smooth it. 9. Shape the dough into a round ball and put in a dutch oven. You could also make it on a baking sheet if you prefer, but I think putting it a dutch oven helps with the crust a little. 10. With a knife, cut a cross into the top of the dough to allow it to expand while cooking and cover. 11. Bake at 350ºF for 30 minutes. 12. Remove cover and increase temperature to 400ºF to bake until browned, approximately another 30-40 minutes. If you check with a thermometer, the internal temperature will be about 190ºF and the probe will come out clean. Tap the outside of the bread, and it should sound hollow… if it does, it is likely done. 13. With a fork, lift up one side of the bread to get it out of the pot. Allow to cool on a wire rack for 40 minutes before serving. 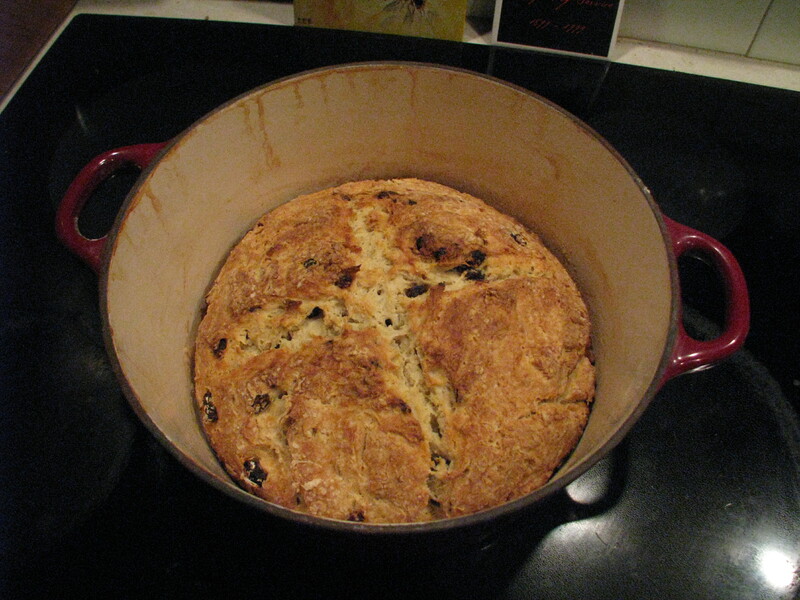 Irish Soda Bread still in pot. This would go great with Raglan Road Guinness Dipping Sauce from CopyKat.com! Yum! I wonder if it is ok in a pinch to reconstitute powdered buttermilk? I have some in the pantry I need to use up. I don’t see why not, as long as it is acidic enough to make the bread rise. If you make it up, and it doesn’t seem very acidic, you can always add a little vinegar or lemon juice to it to drop the pH. I also just posted my recipe for faux buttermilk, as I didn’t have any on hand today. I haven’t seen anyone do it this way, but sometimes folks will use American yogurt straight as it is runnier than the Greek I used.